An ancient wool and textile town located in West Yorkshire on the River Calder. During the 15th-c the town produced more cloth than any other town in Yorkshire. Sadly the textile trade later moved to Bradford with the arrival of the railways. 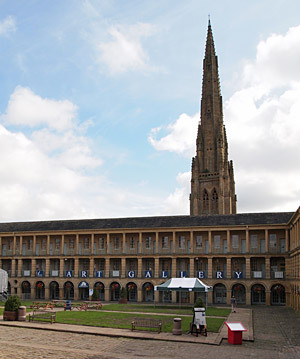 Although the wool trade has gone the old cloth market (Piece Hall) is still standing on the west side of the town, which is now a popular meeting place, events venue and arts centre. 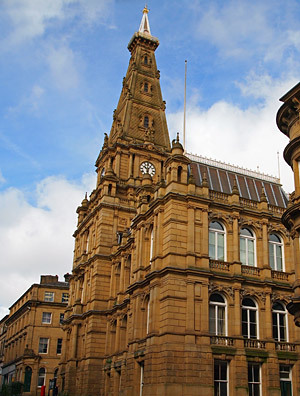 The Halifax Building Society (now part of the Lloyds Banking Group) was founded in the town in 1853. The Halifax plc headquarters is still located on Trinity Road. The town is also known for its manufacture of confectionary, most notably by Nestle. An important landmark in the town is Dean Clough. A large warehouse, measuring some two-thirds of a mile in length. It was once home to the largest carpet manufacturer in the world. Today the converted building is host to an internationally renowned centre for business and the arts. The site also supports a thriving theatre scene, showing popular music events and comedy shows. The mid-19th-c town hall was designed by Charles Barry, architect of the Houses of Parliament. The Halifax Gibbet, an early form of guillotine (1541 to 1650) that was once used in the town to execute cloth thiefs, is preserved in Bedford St. A plaque records a list of the poor souls who were beheaded here. wonderful textiles she collected. Plus a fascinating toy collection and the museum of the Duke of Wellington's Regiment. Changing exhibitions and regular events, workshops and activities throughout the year. Covers the history of the Industrial Revolution in the Calder Valley from clock making to sweet manufacture. On display are a number of working textile machines (circa 1850 to 1930). The kids will just love this hands-on museum, with hundreds of scientific exhibits and interactive activities in six main gallery spaces, covering science, technology and biology. Built by the rich merchants of Halifax in 1770. It houses over 300 merchant's rooms located around a central colonnaded courtyard, with markets, independent shops, a contemporary art gallery, visitor centre and music venue. The architect Thomas Bradley, who designed the Piece Hall, is buried in the front of the Square Chapel on Square Road (a building he also designed, which is now the Centre For The Arts). Facilities: Parking (nearby), picnic area, shop. Fine period house, dating back to the early 15th-c , with oak paneled interiors and a truly atmospheric setting. The rooms have been authentically furnished to recreate life in different periods of history. The Folk Museum and Pennine Barn provides an insite into 19th-c traditional craftsmanship, where tradesmen hand crafted in wood and iron. Regular programme of craft events, workshops and family activities. Facilities: Parking, cafe, picnic area, shop, toilets. Take a peaceful row on the boating lake or have a go at pitch and putt. The nostalgic miniature railway and children's play area are among the various attractions.